Why isn’t this book made out of paper? Because paper doesn’t do hypertext. Wouldn’t it be great to read an early draft of the screenplay, but everytime you had a question the touch of a finger would bring you to a note about the scene (Why “I Got You, Babe”?) or to a later scene revision (watch the Rita pick-up scene develop) or to a comment about the philosophy behind the scene (why can’t Phil leave Punxsutawney)? That’s what this book is. Go into details where you are curious, ignore them where you are not. Skip to items of interest, jump around for random discoveries, or follow chronologically from Pre-Hog, through Hog, and on to Post-Hog. Perhaps a tree-based book will come along someday. I’ll include a ribbon for a bookmark to make it more fun to flip back and forth from text to notes. 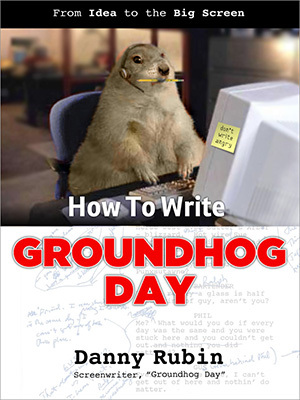 In the meantime, put your finger to good use: press one of the eBook options and begin enjoying How To Write Groundhog Day–today!